The film is a direct sequel to The Land That Time Forgot, which initiated the series in 1975. The story follows a rescue expedition, led by Patrick Wayne in search of his friend, played by Doug McClure, who had vanished many years before. The expedition lands on Caprona, the same fantastic prehistoric land where dinosaurs and barbarian tribes of men coexist. Major Ben McBride (Patrick Wayne) organises a mission to the Antarctic wastes to search for his friend Bowen Tyler (Doug McClure) who has been missing in the region for several years. A British naval survey ship takes them to Caprona. McBride's party: the paleontologist Norfolk (Thorley Walters), gunner and mechanic Hogan (Shane Rimmer) and photographer Lady Charlotte 'Charlie' Cunningham (Sarah Douglas) fly over the mountain wall of Caprona in an amphibious aircraft, but are attacked by a pterodactyl and forced down. They find themselves in a world populated by primitive warriors and terrifying prehistoric creatures, all of whom they must evade in order to get back safely to their ship. They meet a cave-girl, Ajor (Dana Gillespie), who can speak English (she was taught by Tyler); she leads them to the land of a race of samurai-like warriors called the Nargas, who are keeping Tyler prisoner. When the volcano that the Nargas worship erupts, they must escape the cataclysm engulfing the land. Tyler sacrifices himself to cover their retreat. According to Kevin Connor, Amicus Productions wanted to follow At the Earth's Core with an adaptation of the John Carter stories but could not afford the rights so they made this sequel instead. Although the film was made by Amicus Productions, the company folded before it was released meaning AIP took sole credit. The lost world is a "polar continent" rather than the interior of a polar island. Bowen dies in the film and Lisa (Lys in the novels) is already dead during the events of the film while they both survive in the novel. In the book, the ship's crew scale the mountains to come to the rescue. The book ends with two marriages; the film, none. Time Out thought the film "A lame sequel to Connor's earlier Edgar Rice Burroughs adaptation, The Land That Time Forgot, which was at least occasionally lively"; the Radio Times called it an "OK sequel," but a "constipated confection" with "ludicrous mechanised dinosaurs and hopeless acting from an interesting cast." The reviewer however, found that "A few shots, composed around celebrated fantasy illustrations, compensate for all the film's shortcomings"; and critic Derek Winnert similarly opined "the monsters and special effects are below par," but "there are effective moments, and there is some curiosity value in seeing singer Dana Gillespie playing Ajor"; while Blu-ray.com thought the film "may not be the most polished effort around, but there's fun to be had with its crazy dino encounters." ^ a b "The People That Time Forgot (1977)". BFI. Retrieved 11 December 2015. ^ "Exclusive Interview With Legendary Director Kevin Connor". Horror Channel. 7 August 2012. ^ "The People That Time Forgot - Movie Reviews - Rotten Tomatoes". www.rottentomatoes.com. ^ "The People That Time Forgot – review - cast and crew, movie star rating and where to watch film on TV and online". Radio Times. 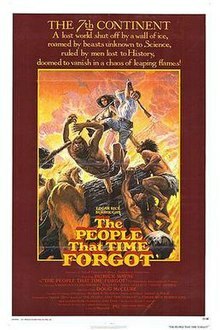 ^ "The People that Time Forgot ** (1977, Doug McClure, Patrick Wayne, Sarah Douglas) – Classic Movie Review 6223 - Derek Winnert". www.derekwinnert.com. ^ "The People That Time Forgot Blu-ray".